Win a Fisher-Price Laugh & Learn Smart Stages Sister! 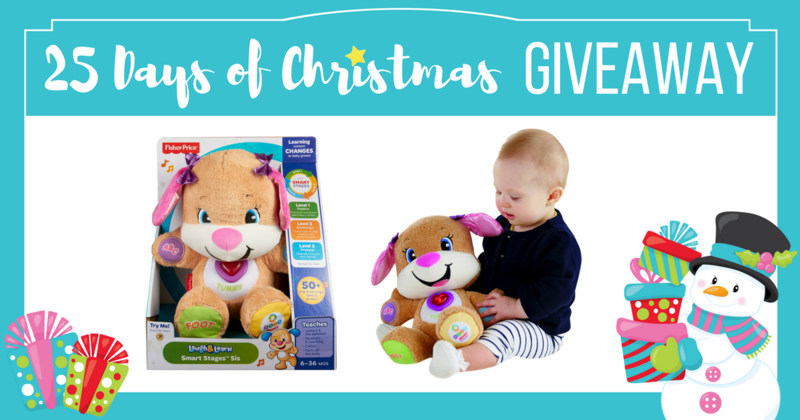 25 Days of Christmas Giveaway hosted by: Everyone Loves Couponing, We Love Couponing, Frugal Finds During Naptime, Mommy Saves Money, Excuse Me Mom & We Love Frugal Finds. It’s the most wonderful time of the year! (admit it, you totally sang that) Christmas lights twinkling, the smell of fresh baked cookies in the air and jolly Old St. Nick. We love Christmas and want to celebrate the holidays with you. Every day for twenty-five days, we will be giving away a toy. The best part? You only have to enter ONCE for all twenty-five giveaways. Wait, it gets even better.. you can increase your chance of winning by doing our daily giveaway entries. You will have a chance to win a toy each day from 11/22 – 12/16. Giveaway will start at 12:00 AM EST on 11/22 and end on 12/16 at 11:59 PM EST. Each day you will have a chance to enter from 12:00 AM EST until 9:00 PM EST. At 9:00 PM EST, the daily winner will be announced on our “Winners Page.” Don’t forget to check back daily to see if you’re a winner. Make sure to complete as many of the entries below as possible for the BEST chance at winning! Check the Winners Page to see if you’re our daily winner! Chances of winning vary based on the final number of entrants. Giveaway ends December 16th, 2016 at 11:59 PM EST. Winner will be chosen randomly and notified on “Winners Page.” Each winner has 15 hours to respond or they forfeit prize. Mommy Saves Money will be responsible for prize fulfillment. If you have any questions, please contact welovecouponingonline@gmail.com. $16.00 in Pepsi Coupons + Pepsi 12-Packs ONLY $1.44 at Target! Stock Up!